I got yards and yards of the stuff, all 'brand new' and unused. It was funny looking at the prices, if only fabric was this cheap still! Last month I also picked up some more vintage goodies. I went along to my local auction and managed to win a lot of paper peiced hexagons, (tons!) loads of fabric, and tapestry projects amongst other things. My favourite were the hexies the owner had already started to sew together, I would love to make my own and finish it off someday. Your hexagon flowers look amazing. 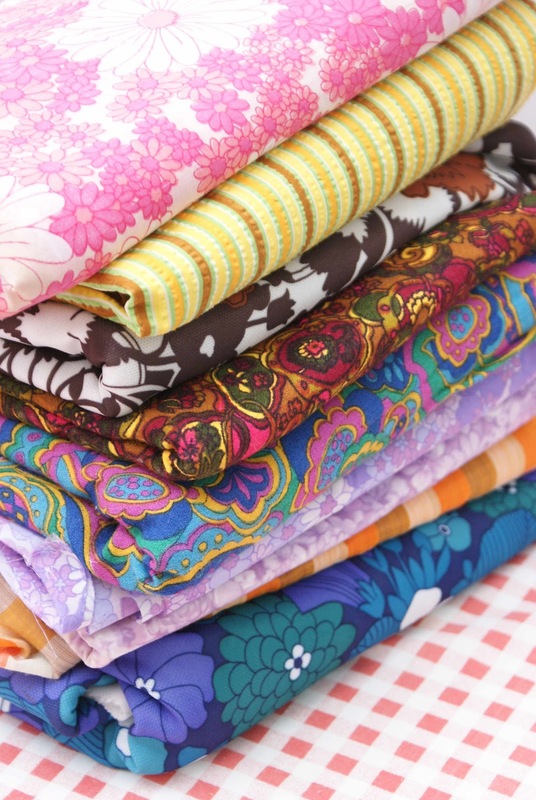 I am inspired (again...) And what luck to have found those vintage fabrics. Here they are very hard to find... Looking forward to you update on the pinwheel thingy. What incredible finds! Those hexies are gorgeous - you should definitely try and finish them off! 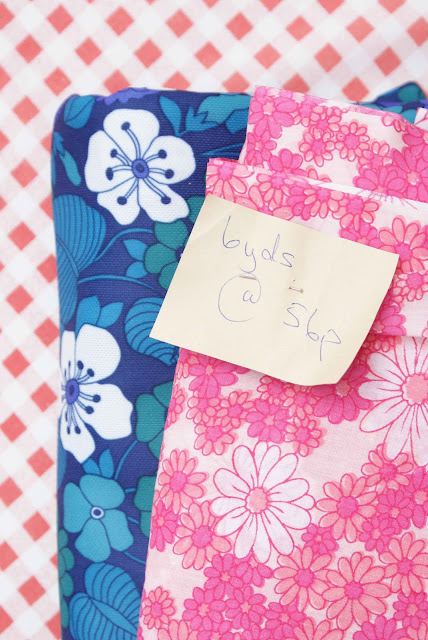 I love that blue & white floral fabric (what an awesome find!). Love the hexies! What a find! I need to start making some hexies - I have the templates, just need to pick out some fabrics. What are you making with yours? Those fabrics what a wonderful bargain...just 1 pound! 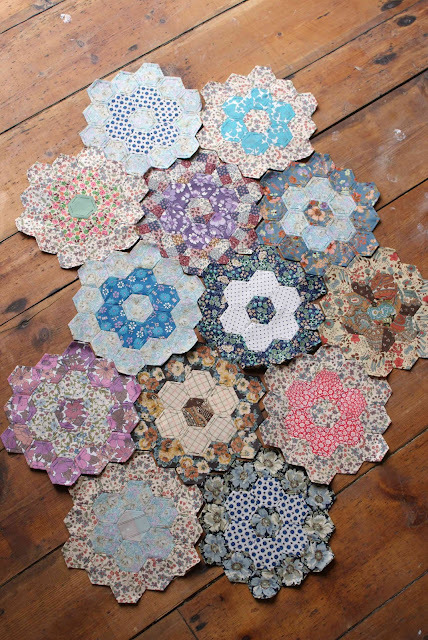 Love those hexies too I wish I knew how to patchwork I feel its something I really must learn. Beautiful fabric Jesse! Oh how I wish I was that lucky at carboot sales! 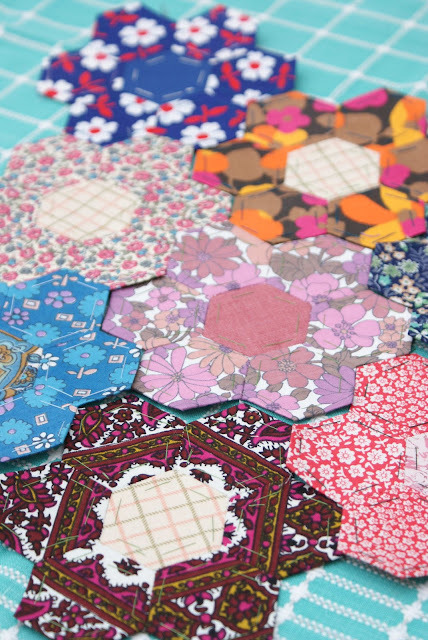 :) I have such a soft spot for little hexies... these ones are gorgeous!